A Canadianastronaut is set to become the first International Space Station commander fromthe Maple Leaf Nation. "Theselection of a Canadian astronaut for a long-duration mission and as Commanderof the International Space Station reflects the achievements of our spaceexploration program and the renowned quality of our Canadian AstronautCorps," Gary Goodyear, Canadian Minister of State for science and technologysaid in a release. Hadfield isonly the second astronaut from a country other than the United States or Russiaselected to command the International Space Station since astronauts beganliving aboard the outpost in 2000. Belgian astronaut Frank De Winne of theEuropean Space Agency was the first during his 2009 flight. Hadfield calledthe opportunity an honor for himself and his country's space agency. "Itmeans a lot for both," Hadfield told SPACE.com. "For the CSA, this isreally another benchmark measure of our steadily increasing capability. From apersonal point of view, I've operated a lot of aerospace machines in my life ?but to command a spaceship, that's just a tremendous thrill." Hadfield isscheduled to launch aboard a Russian Soyuz rocket in December 2012 for histhird trip to space ? and his second long-duration mission. He is Canada'ssecond long-duration astronaut. Constructionof the International Space Station began in 1998. The $100 billion spaceoutpost is currently home to six astronauts ? three from the United States andthree from Russia. During themission's first four months, Hadfield will perform duties as a flight engineer onthe station's Expedition 34 mission, where he will be responsible for carryingout scientific experiments and station maintenance. As a veteranspacewalker, Hadfield could also be called upon to perform tasks outside of thestation if necessary. AmongCanada's contributions to the International Space Station are the lab's roboticarm, Canadarm2, as well as the Dextre maintenance robot designed to performexternal tasks on the station. "Throughour commitment to producing innovative, reliable Canadian space technology andthe expertise of our highly skilled astronauts, Canada has earned theconfidence of our international partners," said Josee Verner, Minister ofIntergovernmental Affairs. In March2013, three of the station's six-member crew will return to Earth and bereplaced with newcomers, while Hadfield will assume the role of Expedition 35 commander. As commander,Hadfield will be responsible for the safety of the crew, ongoing operations andwill oversee the maintenance and equipment of the ISS. He will alsobe responsible for ensuring that scientific experiments onboard the orbiting outpost arecarried out on behalf of Canadian and international scientists. Hadfield may becalled upon to operate the station's robotic arm to perform assembly andmaintenance, or to assist with the docking of spacecraft to the station. "I'mlooking forward to the things that a commander is asked to do, and I very muchwant to prepare all of us so that we're as capable a group of people as we canpossibly be," Hadfield said. "It's a fascinating human challenge tobe a leader. How do I bring people from various cultures and languages together?" In May,Hadfield led a 14-day NASA expedition in the ocean depths off the east coast ofFlorida, in a mock space mission to test exploration concepts and learn more aboutworking in an unforgiving, treacherous environment. The undersea mission alsotested emergencyastronaut rescue techniques for spaceflights. Hadfield'sposition at the helm of the 14th expedition of the NASA Extreme EnvironmentMission Operations, or NEEMO 14, was an invaluable experience in preparation totake command of the space station, he said. "It wasan excellent simulation, and I got to try out different leadership techniques,"Hadfield said. "At the end of it, I sat down with each of the othercrewmembers and told them to be frank and honest about how to do this betterwhen I do it for real. It was a great way to work out some of the kinks." Hadfield'salready-distinguished career in space exploration includes being the onlyCanadian to board the Russian Space Station Mir in 1995, and the first Canadianto perform a spacewalk, when he attached the Canadarm2 to the ISS in 2001. TheInternational Space Station, which was originally slated to end its orbitallife in 2015, has now been extended through 2020. A native of Milton,Ontario, Hadfield was raised on a corn farm and nurtured a love of flying froma young age. He joined the Canadian Armed Forces in 1978 and trained as afighter pilot, and later as a test pilot at Edwards Air Force Base inCalifornia. 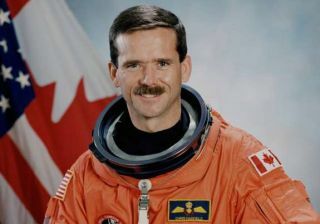 In 1992 Hadfield was selected to join the Canadian astronaut corps. Hadfield hasalready begun training for the upcoming mission ? part of a 2 1/2 year processin the buildup to launch. In 2009, he also trained as a backup for fellow Canadian astronaut Robert Thirsk, who took part in Canada's firstlong-duration mission on the ISS. At theconclusion of the mission, Hadfield is scheduled to land in Kazakhstan in June2013 aboard a Soyuz spacecraft. And despitehaving a career already punctuated with milestones, Hadfield remains humbleabout his latest achievement. "Most ofit is good timing," Hadfield said. "I'm one of the early Canadianastronauts, and that's just the way it's worked out. But, the beauty of it isthat it has built on itself, and I can draw on the experience I gained eachtime. This is how it has unfolded and I'm very grateful for it."